TMA member Alarm Detection Systems in Aurora, IL has won the Police Dispatch Quality (PDQ) Award for the second time. 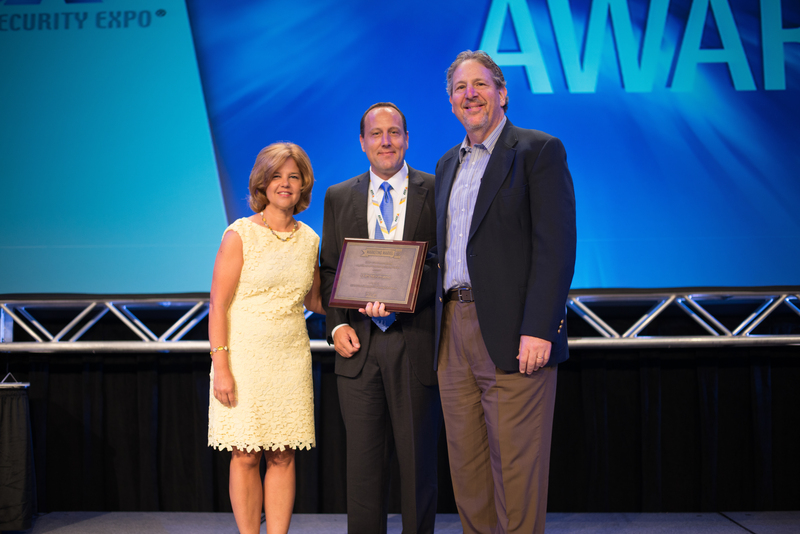 They were honored at ESX in Nashville, TN last month. Pictured, left to right: Keith Baird of Honeywell; Ed Bonifas, Melissa Hodgetts and Ed Lubic of ADS; SSI Editor-in-Chief/Associate Publisher Scott Goldfine. Photo by Matthew Lynn Photography. The Police Dispatch Quality (PDQ) Award program targets the alarm management issue by recognizing those installing and monitoring companies that follow established industry practices and partner with law enforcement to achieve the highest quality in minimizing police dispatch requests. It was established jointly in 2005 by the Security Industry Alarm Coalition (SIAC), False Alarm Reduction Association (FARA) and SECURITY SALES & INTEGRATION, and now also officially endorsed by the Installation Quality (IQ) program and sponsored by Honeywell. ADS has been a leader in dispatch reduction efforts for over two decades. They were one of the very first companies to appoint a staff position to review the previous day’s dispatches, call customers, determine corrective actions required and apply the necessary resources to resolve the issue. The goal of the PDQ program is to raise industry-wide awareness, motivate alarm companies to be proactive and provide models that work for others to follow. TMA thanks and congratulates Alarm Detection Systems of Aurora, IL! CSAA International announced the winner of the CSAA 2015 Five Diamond Marketing MARVEL Award on June 25 at the Electronic Security Expo (ESX) in Baltimore, MD. COPS Monitoring was honored for promoting its CSAA Five Diamond status to gain a competitive edge in the marketplace. The CSAA Five Diamond Marketing MARVEL Awards Program recognizes CSAA Five Diamond companies that have used their CSAA Five Diamond designation to better position themselves in the marketplace. This program is sponsored by Security Sales & Integration (SSI). Left to right: CSAA President Pam Petrow, COPS Monitoring Director of Marketing David Smith, and SSI Editor-in-Chief Scott Goldfine. Photo by A Day in the Life Productions. The company submitted an integrated marketing plan that prominently featured their CSAA Five Diamond status on advertising, newsletters, their website, exhibits, company overview, sales literature, and even business cards.